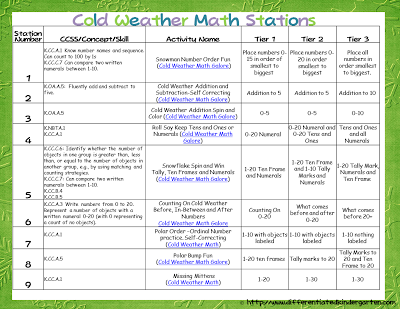 Cold Weather Differentiated And Aligned Math Stations. It’s that time again! Time to start planning math stations for January. 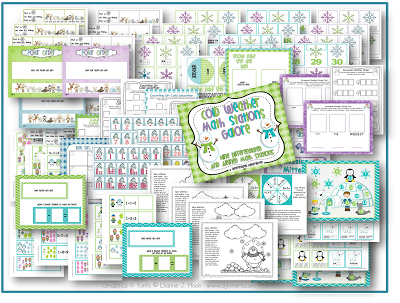 I could decide what skills to put in my ‘math galore’ pack this month, and I really wanted to give everyone enough variety to give you choices and to be sure to meet the skill levels of ALL you students so this one has nine different activities. Yep Nine! It’s a doozy. Of course, they are differentiated and aligned and I kind of laid them all out by standard and show you how I differentiate them here. Pick and choose what you like based on your students readiness levels and needs. I do have a write the room and I-Spy that should be done in a couple of days as well. If you would like to take a closer look or get a copy of this plan layout, just click on the picture to get a copy off from google docs. Even though I haven’t been in school since the 19th (yah for two snow days . . . )it’s not like I haven’t been hanging out with 5 and 6 year olds. Luckily my two youngest sons have been more than willing to test out these new stations for me and it was a great way to keep them occupied. 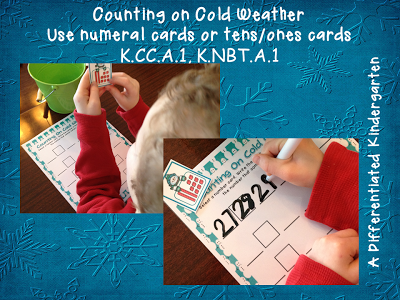 So here’s the skinny… ALL of these centers come from the Cold Weather Math Stations Galore Pack. Click on any picture to check it out. 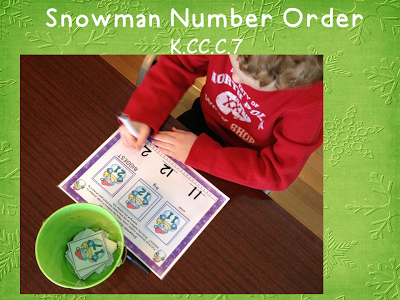 Station 1: Snowman Number Order Fun: Using the same Snowman Number cards from Missing Mitten activity, students randomly select numbers and place them order. There is a colored recording sheet or a black and white version. 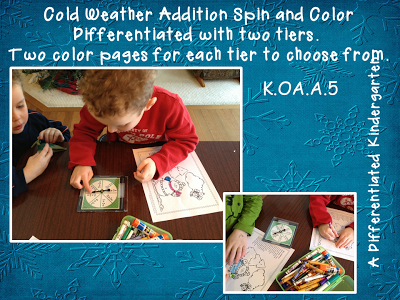 Station 3: Cold Weather Addition Spin and Color. 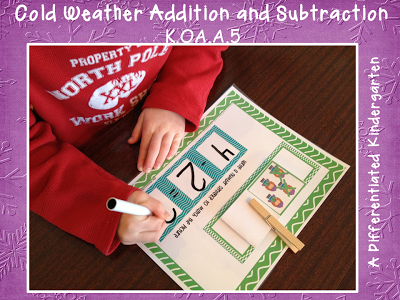 This activity is an addition activity with two tiers. Tier one is to five and tier two is to 10. There are two separate spin and color sheets for each tier. 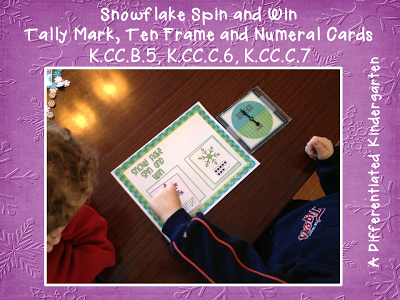 Station 5: Snowflake Spin and Win: Numeral cards, ten frame cards and tally mark cards are available to help differentiate this number comparison game. 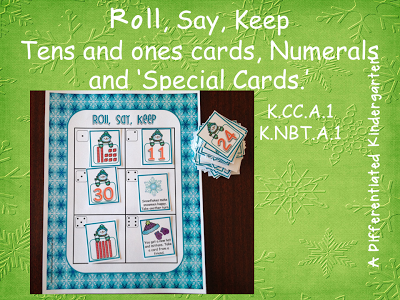 Station 6: Counting on Cold Weather-Use Roll Say Keep Snowman number cards to count one, identify numbers that come before and after. Black and white and colored recording sheets available. 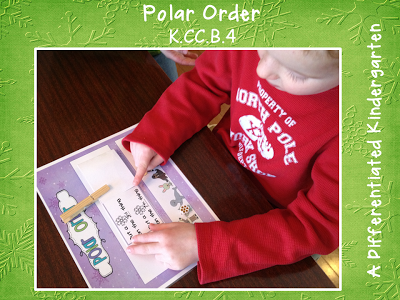 Station 7: Polar Order: Three different self-correcting activities for practicing ordinal numbers. 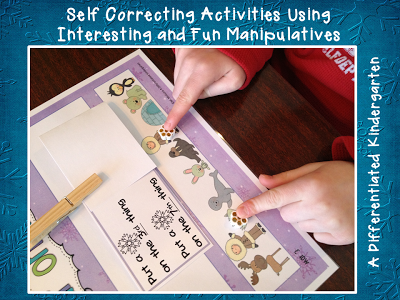 I love self correcting activities and this is one that allows them to be very independent. Station 8: Polar Bump Fun. There are three different tiered mats for this activity. Players use tally mark and ten frame cards for this game depending on readiness. 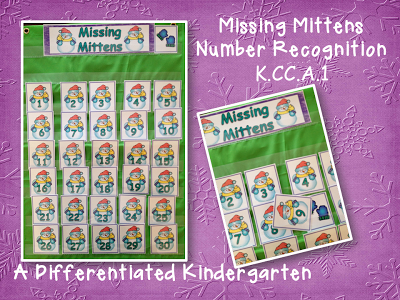 Station 6: Missing Mittens: Number recognition. Can be tiered for numbers up to 30. So that’s everything that’s included here in one unit. 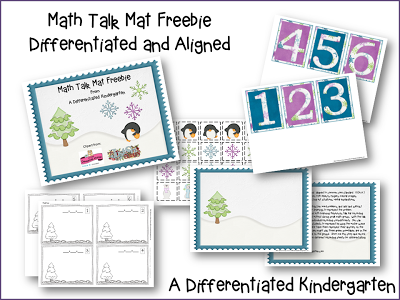 Also, don’t forget to grab my math stories freebie and sign up for my TalkBar Recorder Freebie. I love this thing. I only wish I had about three more. The giveaway ends next week so sign up now. Thankfully working on new math stations . 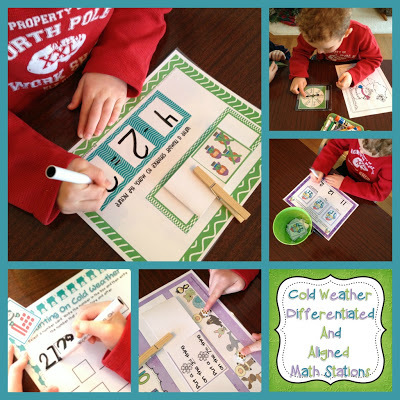 . .
St. Patrick’s Day Math Stations Differentiated Plans and a FREEBIE! I absolutely love your unit and can’t wait to try it with my students…..thanks for your differentiated products! I need to get this for my daughter… can’t let her have 2 weeks off of school for the break  Your units are adorable and amazing! I have an ususual question for you or any of your readers. I use Expo or sometimes other brand markers with these and other products that I have laminated. I find that many of the colored markers “stain” the activity. Does anyone else have this problem? Is there a brand, color, cleaner, that someone could recommend to me. Thanks for the great units. I use them often in my class. This is just wonderful. 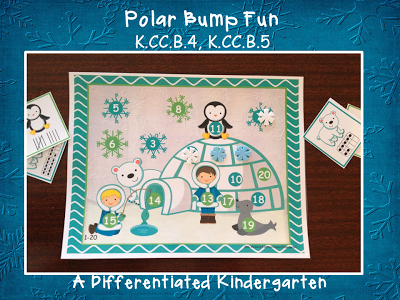 It’s a perfect unit for this time of year for a teacher or home school teacher. Thanks again. 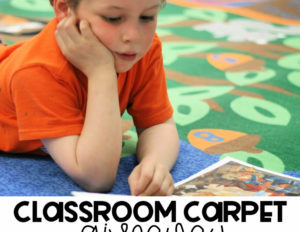 Do your students complete one activity per day? You seriously make the best stuff! I need to get these printed and ready for next week! Thanks dear!